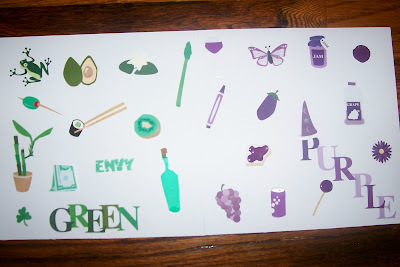 Well, I've really been slacking with this new blog thing! I have so many projects and things to share, but I never seem to get a chance to take pictures and post anything! Since Aaron's been born, I only seem to scrap pictures of him, so here are a few of my most recent layouts for his album! Sorry about the bad pictures! My camera was not on my side tonight! I used Wild Asparagus paper on this layout, along with a MME "Our Family" rub on, and prima flowers. 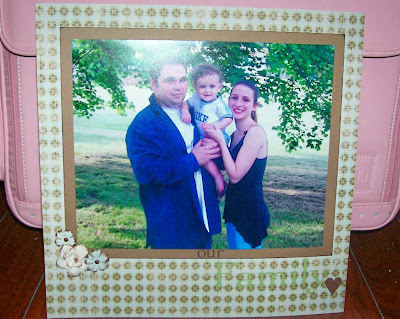 I matted my picture on inked cardstock, and I also inked the edges of the flowers. The rub on is much more visible in person! This paper and all of the cardstock embellies were part of the Scenic Route line that I picked up at CKC this summer. The bottom block says "Just add water". Well thanks so much for stopping by! Hopefully I can post more pics soon! Happy Thanksgiving! I hope everyone had a great one! I know we did. My mom, Aaron and I went shopping yesterday morning to Big Lots (YAY!) and Kmart. We go to these two stores EVERY YEAR on Thanksgiving. Big Lots just because its the best, and Kmart for the board games! I found some great scrapbook items at Big Lots yesterday, and got Aaron a few more Wiggles DVDs for Christmas! I can't find Wiggles movies around here anywhere, but somehow Big Lots has them for $4 which is pretty great! Since that was so exhausting, we decided to go grab the breakfast bar at Shoney's then we headed to Kmart. My two game picks for this year were Clue and Trouble. They had an abundant supply of Clue, but Trouble was MIA. So I finally just gave up, and while we were strolling through the toy aisles, something caught my eye...Could it be? TROUBLE?! IT WAS! So I RAN FOR IT! Little did I notice that I almost knocked over a very nice gentlemen at least double my size. Oops. I told him I was SO sorry; I was terribly embarrassed. My mom was dying of laughter which got Aaron laughing which was pretty cute. I don't know what came over me! I just had to have that game! Then we went to my Grandma's for dinner, which was wonderful as always. We had tons of fun and stuffed our bellies to the max. Then we went over to my husband's parents for a quick visit, but by then we were so tired and full we just wanted to go home. Then this morning (my mom and I's other annual tradition) I got up at 2:30 and picked mom up at 3:00. We were outside in the line at Toys R Us by 3:30 in the freezing cold, but it was so worth it! There sales were amazing! Mom got $30 MP3 players for all of my siblings for $10 each! 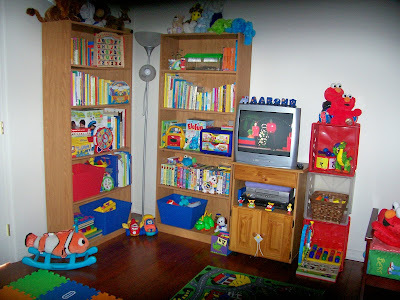 But I lucked out the most with an easel for Aaron, a Story Reader, a baby doll for Lexy, a really cool thing called Pixel Chix for Lex, a Little Tikes tool center, the new Charlotte's Web DVD, a Doodle Doug and Sesame Street appliques for Aaron's walls! The Doodle Doug is super cool, I recommend looking it up. He's kind of like a Spirograph, but much better! I'm going to save it for a little while until Aaron's ready for it, but he is so cute and only $4.99, so I couldn't pass him up! There's also something I'd like your feedback on-I bought Aaron a shopping cart. Jamie hasn't seen it yet, but I'm sure he won't be happy about it. Do you think its wrong for a boy to play with a shopping cart. He just loves to push things around, and he loves the carts at the store. Plus it comes with play food, and at our church we have a play kitchen with play food, and its hard to tear him away from it. I'd really like to get him a kitchen, but Jamie said "absolutely not". Oh well. After the toy store, we went to Ollies and the Dollar Tree, and we got some pretty great stuff there too. Then, how could I pass up a trip to the scrapbook store? When we walked in, they gave both mom and I a 40% off coupon for one item, PLUS they took 25% off your entire purchase! I bought 2 Little Davis paint kits for $2.50! I also got a few sheets of paper, some rubons, and with my coupon, I got Aaron's Sesame Street album, and mom got me the laminating refill for my Xyron with her coupon! After all my discouts I only paid $12 for the album! WooHoo!!! PLUS, if you spent $30 you got a free gift, and I spent $33.33 (how lucky!) so she stuck something in my bag and said "Here's your free gift, have a good day! ", but I didn't see what it was until I got home. She stuck a very cute Christmas sticker set by Making Memories in my bag (a $5 value) AND a November 2007 Scrapbook Trends magazine-a $14.95 value! What a deal! I love magazines, but can never justify the price! What a great sale! Then on the way home we stopped at the Goodwill, because I felt something there calling my name. What a great Goodwill day! I bought a train for under our tree for $5! Aaron loves it. I turned it on and he started clapping and yelling "WHEE!!!". It was adorable! I also got a brand new Smore's maker for $3! I LOVE Smores! Now I'm going to make them every night! This is the first time I've ever bought something other than toys/books/movies for Aaron there! But I did end up buying Aaron a Little People garage and he played with it for ours this afternoon. I can't believe the things you can find there that are in perfect condition! I Love the Goodwill! :) It was really a perfect day. We had so much fun and laughed until our ribs hurt! And the sales we got were better than any sales we've ever gotten before! And I had the best Goodwill trip too! AWESOME DAY! 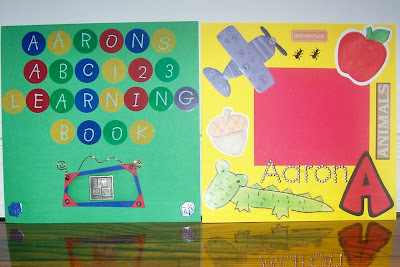 Here is a learning book I've started making for Aaron. As you can see, I'm not finished with all of the pages, nor have I added pictures in, but I'll get to it! I haven't finished his letter I, Q, V, X, or Y pages because I've been having a hard time finding things for those letters. I also have black and white pages to finish for the colors and I haven't even started on the numbers. Hope you enjoy! 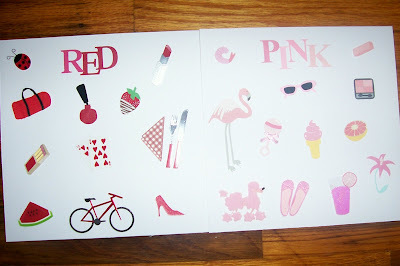 The letters on the title page were old stickers I had. They worked perfectly though! 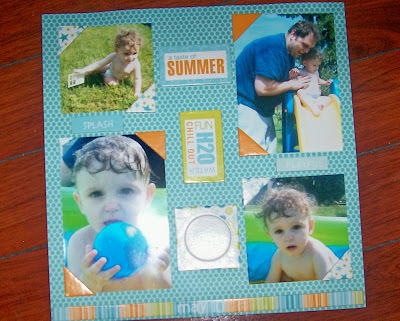 The brads at the bottom of the page are blocks that came out of the Around The Block Baby set. There is also a Paper Bliss block embellished with wire and an ABC block. The A page is my favorite! The apple and acorn die cuts are MME. The airplane is an embossed sticker from WeR Memory Keepers I believe. There are 2 little ant brads, an adorable alligator, and the "Aaron" is MAMBI (I think) with little silver beads. 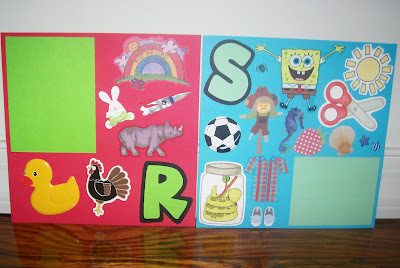 I cut each letter out with the Coluzzle Puzzle template, and have a photo mat on each page as well! 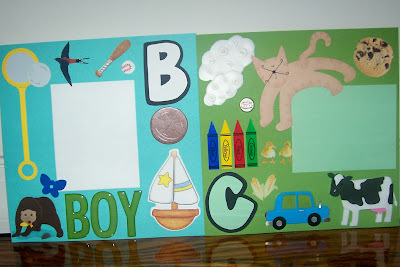 The B page has a Jolees foam bear, a wooden bat and ball, a MME boat, a wooden basketball (its hard to see), a small Jolees bird, a bubble die, a metal butterfly and the word BOY. 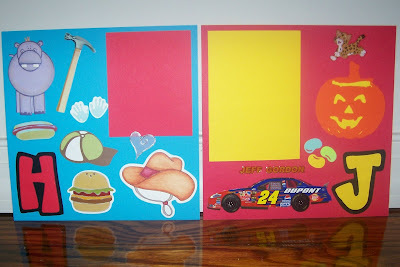 The C page has embossed cloud stickers, a Paper Bliss cat, a cake brad from Around the Block Birthday treats, a cookie sticker from EK, crayon stickers, cute little chick stickers, corn on the cob from Jolees, and a foam car and cow from Jolees also. 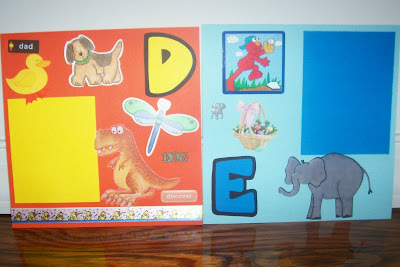 The D page has a dog and dragonfly die cut from MME, a Paper Bliss duck, a dinosaur sticker, a "Dad" word plate, a "dog" word embellishment, a "discover" word block, and Suzy's Zoo duck ribbon! 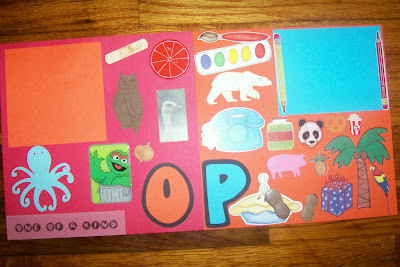 The E page has an Easter basket with eggs in it, an elephant sticker from We R, an elephant brad, and an Elmo sticker. This page needs something else, any suggestions? 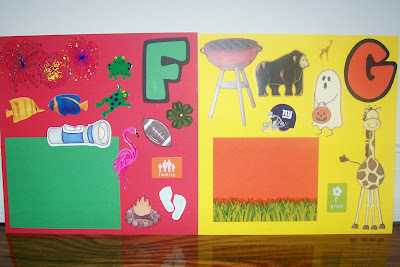 The F page has Mrs. Grossman's fireworks stickers, frog, fish, and a flamingo sticker, a wooden football, a Prima flower, a MME flashlight, a family picture plate, feet die cute from Jolees, and a campfire sticker from MAMBI. The G page has a grill and gorilla sticker, a Giants helmet, a giraffe brad, a ghost sticker from MAMBI, a grass sticker on the photo mat, a giraffe from WeR, and a grow picture plate. 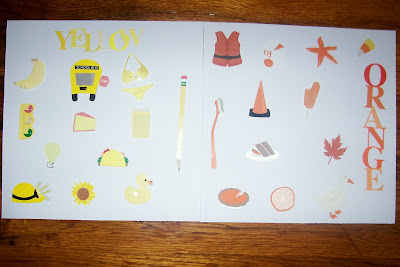 The H page has a hammer, hot dog, and heart sticker, a hippo sticker from WeR, hand dies from Jolees, a hamburger and cowboy hat die from MME, and a hat die from Seventh Avenue. The J page has a jaguar sticker (from Go, Diego, Go! ), jelly bean QuicKutz dies, a jack-o-lantern, and Jeff Gordon's car and words. 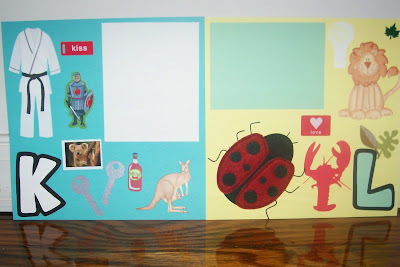 The K page has a Jolees karate outfit, a knight, ketchup, and kangaroo sticker, a kiss word plate, key die cuts, and a koala sticker from a pack I bought at the zoo in DC. The L page has a die cut light bulb with yellow chalk on the inside, a lion from WeR, a leaf brad, Jolees leaves, a love word plate, a lobster die, and a large ladybug from Jolees! The M page has a large glass of milk, a cute little Paper Bliss mouse, a WeR monkey, a mom word plate, a moon die, a mustard die from MME, a motorcycle bard and a mouse die cut. 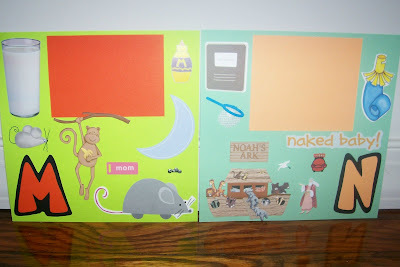 The N page has a notebook die, a MME noisemaker die, a net, Noah's Ark from EK, the words "naked baby!" 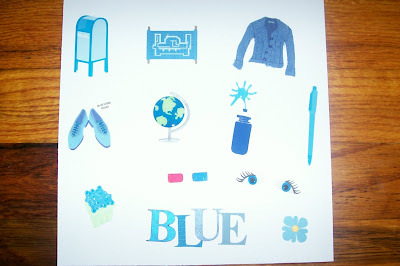 and a Blues Clues notebook sticker! The O page has an orange sticker, a sticker that says "Ouch!" an owl die cut, an ostrich sticker from the zoo, an Oscar the Grouch page tile from EK, an Animal Kingdom octupus, and a "One of a Kind" vellum saying. The P page has MME die cut paint, phone, pickles, and a pie, a polar bear, pretzel, panda, popcorn, pencils, and a parrot stickers, a foam Jolees pig, and MAMBI palm tree, pineapple, present, and peanuts. The peanut fell onto the pie in the pic, but its fixed now! The R page has a MME rooster, a Jolees rubber ducky, a rabbit, a rocket, a rhino sticker, and a MAMBI rainbow that says "This is the day that the Lord has made". The S page has a MAMBI spider, a MME snake, sun, and scissors, Queen and Co star brads, a Spongebob, seashell, seahorse and shirt sticker, shoes, a wooden socccer ball and a strawberry die. 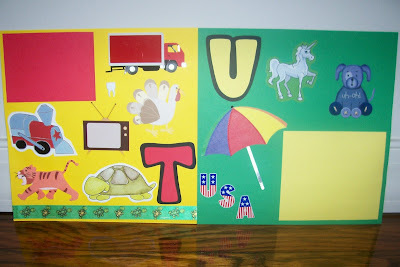 The T page has a foam Jolees truck and tiger, a Jolees turkey, a MME turtle and train, a tooth brad, a TV sticker and Suzy's Zoo turtle ribbon. The U page has a unicorn sticker, a Jolees umbrella, USA stickers, and a sticker that says "Uh-Oh." This page also needs something else. 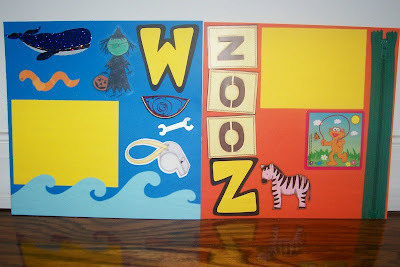 The W page has a Jolees whale, a worm sticker, a MAMBI witch, a wrench, a MME whistle, a quilled watermelon, and Animal Kingdom waves. The Z page has WeR ZOO stickers, a zebra, a Zoe sticker, and a Junkitz zipper. These color pages were all done with the Jolees sticker packs. I had considered buying them for a few months, but they were $5 per color and I just couldn't spend that much money on them! But when I went to CKC this summer a vendor had them for $1.50 each, so I snatched them right up! There is also a white and black one I need to finish. I put them on plain white paper so it doesn't distract Aaron from the actual color itself. Well, Aaron's room is finally finished! 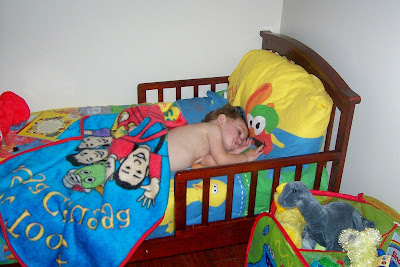 We put a new bookcase in this past week, and I bought his new "Big boy bed" last night! He also got all new bedding! The only thing left to do is the walls, but that is being put off for a while so we can work on the rest of the house. So much to do! 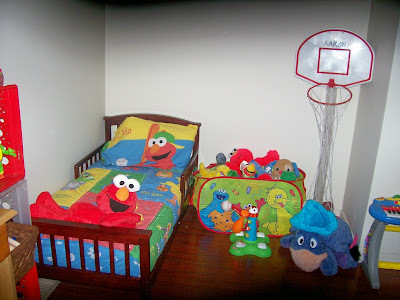 Here are a few pictures of him and his room! This is his new bed! 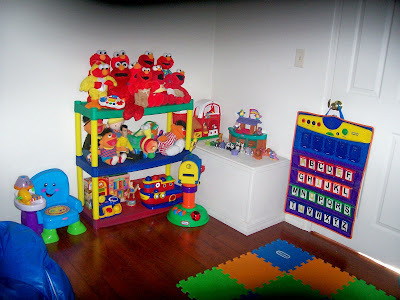 These are all some of his Elmos and other toys! Here are all of his books and some more toys! Here he is taking his first nap in his new bed! We're having a great weekend here. The weather is getting pretty cold so we're trying to stay warm indoors! I took Aaron, my baby brother and my niece to a Hannah Montana birthday party this afternoon and we had tons of fun. Aaron got into the cake so badly that he had to come straight home and get a bath! I hope you are all having a great weekend! 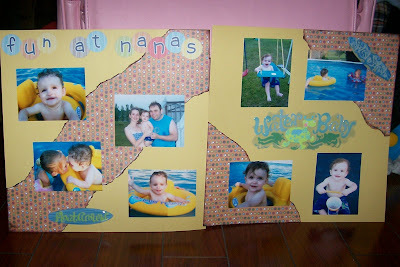 After church tomorrow I am hoping to spend the rest of the afternoon in my scrapbook room and get some work done! Check back for my progress (hopefully!) Thanks for stopping by! 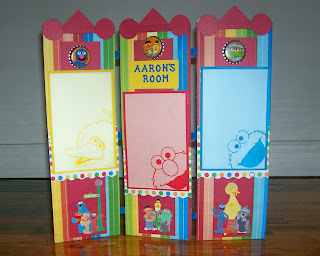 Here's a little project I've been working on for Aaron's new Sesame Street bedroom. I took a tri-fold screen class at CKC this summer, so I just changed some things around to make it work for Aaron! I used some EK Success Sesame Street stickers, some bottle caps, I cut a few blocks out of the EK Sesame Street paper, and the background paper was Imaginisce. I have had so many comments on these screens that I've decided to make these for a few family members for Christmas. I will post pics of those later when I actually get to work on them! Hope you enjoy! Thanks for coming to check out my blog! I am hoping to start posting pics of some of my scrapbook/card-making/altered creations, along with blogging about my daily life. I am a married mother of the cutest little boy you will ever see! I live in WV and I'm a pharmacy technician by day, and a scrapbooker/mother by night! I love old movies and TV shows (I Love Lucy is my FAVORITE)! I'm currently decorating our newly renovated house and I'm always looking for new ideas! I go to a very small, country church where I have been a member since birth, and I LOVE it! I'm really hoping to get into this blogging thing, and meet some new people that share the same interests as me! Thanks for stopping by!